Hoops Highlights — New Heights Youth, Inc.
For the second year in a row, one of the coveted 24 roster spots for the Boys’ McDonald’s All-American Game will go to a New Heights student-athlete! 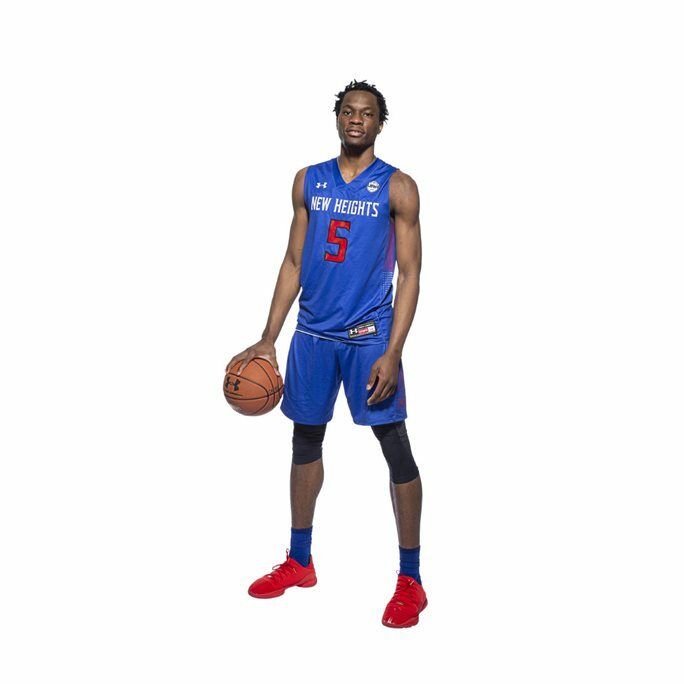 On March 27, Precious Achiuwa will take part in the McDonald’s All-American game; now in it’s 42nd year. Precious has been a part of New Heights since 8th grade. He attended St. Benedict’s Prep in New Jersey for his first three years of high school before moving on to Montverde Academy in Florida for his senior season. Currently, Precious is ranked No. 16 in the country according to ESPN and No. 13 in 24/7 Sports’ rankings. The McDonald’s All-American Game takes place on Wednesday, March 27 at 7 p.m. in Atlanta, GA at the State Farm Arena; home of the Atlanta Hawks. Last year, New Heights was fortunate to have one boy and one girl selected to the prestigious game – Moses Brown, now at UCLA, played in the boys’ game and Emily Engstler, currently playing at Syracuse, repped the program in the girls’ contest. In January, the rosters for the 2018 McDonald’s All-American Games were released, and we are thrilled to share that two of the coveted spots belong to New Heights’ own Moses Brown and Emily Engstler! Being selected for the game is an honor bestowed upon only the best high school players in the United States and Canada, and rarely has a male and female player ever simultaneously represented the same grassroots program. In 2018, New Heights is the only program in the country to be represented by both a male and female participant. The 41st annual boys game and the 17th annual girls game will take place on March 28, at Philips Arena, the home of the Atlanta Hawks. On Friday, Feb. 2, ESPN showed a nationally-televised high school game that took place in Queens and featured Christ the King and Archbishop Molloy. New Heights was represented on both sides of the court as Molloy features recent McDonald’s All-American selection and UCLA Commit Moses Brown while CK features sophomore sensation, Ryan Myers. New Heights alum Corey Edwards was also part of the action as an assistant coach at Christ the King. It was a great game that showcased the deep talent in New York City, but Christ the King pulled out a hard-fought three-point win spearheaded by Ryan Myers’ stellar shooting. Ryan finished with 17 points on the afternoon, including nailing 5 three-pointers. Ryan is also this months New Heights Student-Athlte of the mntCongrats to both of them as they represented themselves and the program the right way on National Television. Jaquan Carlos is a 14 year old guard from Brooklyn and is finishing up the eighth grade at M.S. 113; he plays on New Heights 15u UAA team this year. Jaquan is widely regarded as one of the top guards for the class of 2021 in New York and he lived up to that hype on Saturday at the UA Next Combine in Washington D.C. The UA Next Combine Series is an invite only program where select eighth graders receive high-level teaching and instruction, and compete for invitations to the “UA Next Experience” at the Under Armour Elite 24 in August. Jaquan showed off his court vison, and stellar passing and scoring ability all day, helping to lead his team to a huge win in their second game, by racking up 12 points and 7 assists. In regards to his play, Jaquan commented “I played well at the Combine but could have been more aggressive taking shots.” The future is bright for Jaquan Carlos and he is a player to watch as he goes into high school next year. This past weekend, all three of New Heights’ middle school girls teams participated in the BBall Shootout in Mahwah and Fairfield, NJ. All three teams went undefeated en route to sweeping the championships. The 8th grade team, led by Alana Jones, Kateri Poole and Janaysia Brown, won all of their contests by double digits. The 7th grade group was spearheaded by Naijah Vann, Kayla Morris and Janel Moore. For the 6th grade group, Reyna Scott, Tyler Cohen and BreAuna Ware led the charge – including an overtime thriller in the championship. Congrats to our middle school girls! It was a Daily Double for New Heights this past weekend as both our 5th grade boys and 8th grade boys won the championship at the competitive Funsport Junior Pro League. First, on Saturday, our 5th grade group, led by Coach Kenny Satterfield, won three games in a row against 6th grade teams culminating with a championship game victory over Positive Direction. Nazir Robinson was named most outstanding player. Then on Sunday at the Barclays Center in Brooklyn, the 8th grade team defeated the NY Rens in the title game, 32-22. It was an amazing opportunity for our student-athletes to be able to play on the same floor as the Nets. Ryan Myers continued his outstanding play of late, socring 16 points and earning MVP honors. Isah Muhammed was also stellar, scoring 8 points, grabbing 12 rebounds and blocking 6 shots. Congrats to coaches Rodney Frazier, Corey Edwards and Corey Sherman on the championship. Thanks to Funsport and Under Armour for hosting a great tournament. This past weekend, led by coaches Rodney Frazier and Corey Edwards, our 8th grade boys team won the prestigious BBall Spotlight Tipoff Classic. Behind the hot shooting of Ryan Myers, our squad beat the Playaz Basketball Club in the semifinals and Team Final in the championship game. Myers was named tournament MVP after scoring 26 points in the semis and 28 in the chip. Isah Muhammed, Tyler Jacobs, Richard Springs and Trey Alexander also had strong showings and helped the team to their first title of the young season. Our 5th grade boys' team, led by coaches Kenny Satterfield and Kenny Robinson, won the A Game Super Shootout this weekend, defeating the Riverside Hawks in a terrific, hard-fought championship game. Nazir Robinson, Jaiden Williams and Daryl Wright led the charge in the title game, making big plays down the stretch. Along the way, the team beat the DMV All-Stars, Team Takeover and Havoc City. The National Signing period for High School Seniors is Nov. 11- Nov. 18. During this week, Senior Student-Athletes from across the country make their final decisions on which colleges they plan to attend. Last night one of our own Students athletes, Sydney Zambrotta, a North Babylon native and Christ the King Senior, signed her National Letter of Intent to the University of Louisville. Sydney, ranks in ESPN's Class of 2016 as 29th overall and 9th for her position. She decided on Louisville over other top D1 schools such as Minnesota, Pittsburgh, Miami (FL) and South Carolina. Congrats Syd! We wish you the best and good luck on this upcoming season. New Heights junior Sid Wilson was recently profiled in the New York Post. Wilson, who attends St. Raymond HS in the Bronx, had to overcome the tragic loss of his mother last year. With the support of his loving family, the honors' student has used basketball to help deal with the devastating loss. "During that time I was really hurt, Wilson says. "Basketball really helped me a lot." Our 6th grade girls team made their debut this past weekend, competing "up a grade," in the 7th grade division of the BBall Shootout Fall Classic in New Jersey. Led by coach Chez Williams, the group came away with the championship, winning all of their games in convincing fashion. It was a great team effort! New Heights’ 16-under team recently won the prestigious Gaucho Roundball by defeating the host team in the championship in a hard-fought game. Precious Achiuwa won the MVP for the title game. Led by Idan Tretout and Omar Silverio, New Heights beat the Rens in the semifinals as the team went 5-0 for the tournament. Idan, Omar, Tyson Walker and Dajuan Piper were all named to the all-tournament team. Coach Oz Cross & 16U champs. From the jump ball until the final horn they were committed to playing hard-nose defense which they have done all season. In a league where the best teams from NYC and New Jersey were participants, our New Heights team prevailed. The New Heights 12U/7th grade team ended the “Rose Classic Fall Girls Basketball 2015” league with a perfect 8-0 record and were crowned the Champions for an unprecedented 5th consecutive season. Great job by these young ladies & coaches!